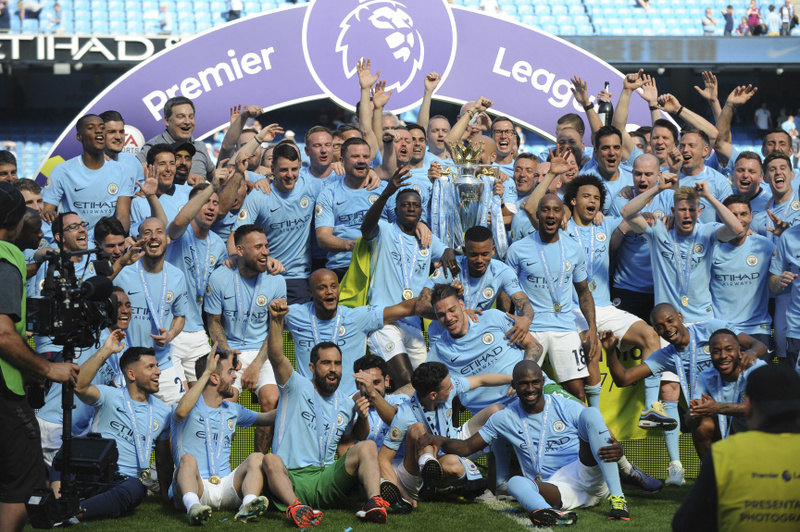 MANCHESTER, England (AP) — Blue-and-white tickertape flew up and fireworks exploded as Manchester City's players finally got their hands on the Premier League trophy on Sunday. They couldn't mark the occasion with a potentially record-breaking win — City surprisingly drew 0-0 with relegation-threatened Huddersfield — but it didn't stop them basking in the glory of a stylish and runaway title triumph that was clinched in record-equaling time two weeks ago. Pep Guardiola was thrown in the air by his squad. Yaya Toure danced and jigged with his teammates on one of his last appearances on the Etihad Stadium turf. Some of the backroom staff swigged on huge bottles of champagne. City's fans, who earlier defied orders to not invade the pitch after fulltime, chanted song after song about their favorite players. The crowning moment on a beautiful, sunny day in east Manchester came when Vincent Kompany raised aloft the biggest prize in English football, the third time the long-serving City captain has done so in seven seasons. He'll never get tired of doing it. There are still two games left in City's league season — and still time for City to break the record for most points, wins and goals in a single Premier League campaign. Then City will aim to become an even more celebrated team by retaining the title for the first time. "England is a special place and is so tough. Today we saw it," Guardiola said. "You never know if you are going to win, but I had no doubt what I had to do. "To make back-to-back titles in this league will be tough, but we accept the challenge." Even Guardiola, a perfectionist, might let off his players for their lowering in standards against Huddersfield. 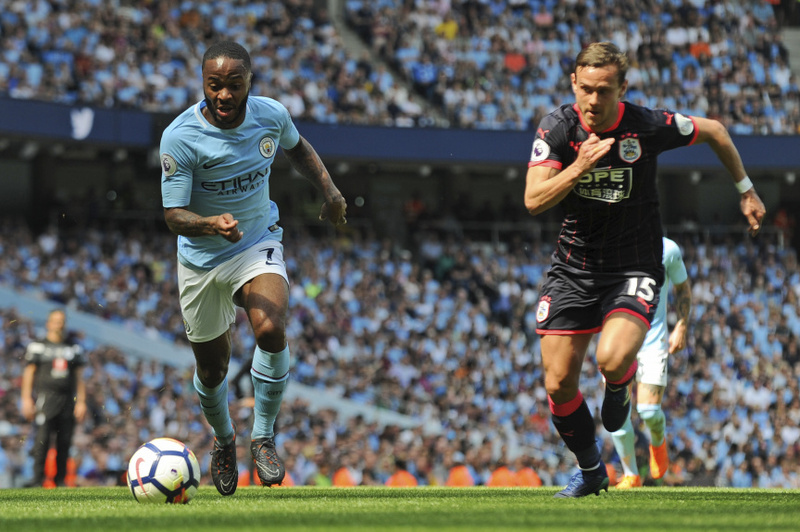 On a day when fans partied inside and outside the stadium and the side entered to a guard of honor made up of the Huddersfield team as well as players from City's title-winning team from 1968, City produced one of its sloppiest displays of the season. The final ball was lacking and even David Silva misplaced some passes. It was the first time this season City had been kept scoreless at home in the league, the last occasion being in April last year in a 0-0 draw against Manchester United. In fact, Huddersfield had the better chances — through Chris Lowe and Florent Hadergjonaj in the first half — before defending deeply and obdurately after halftime to secure a point that could prove crucial in its bid to preserve its place in the Premier League. Huddersfield moved three points clear of the relegation zone with two games to play — against Chelsea and Arsenal. As for City's players, they still require two points, one win and two goals to set milestones in a season when Guardiola's side cruised to the title playing the kind of football rarely seen in the English game. City's remaining games are against Brighton at home and Southampton away, and Guardiola is sure to rotate. Toure, for example, will get his Etihad send-off against Brighton after eight years at City where he has been one of the most influential players at the club and in the league. Toure was given the biggest cheer by fans as City's players walked up to the stage to collect the trophy. As many of them jumped on the midfielder, the trophy fell off its perch and onto the grass. A minor blip on a special day for City.